The Elgin Hotel is located close to the Mall. The Elgin Hotel is a popular unit of the Elgin Heritage Groups of Hotel in Darjeeling. The hotel is one of the best luxury hotels in Darjeeling offering unparalleled services and amenities for all kinds of travelers. The Elgin has hosted renowned personalities like the US Ambassador, the Crown Prince of Sikkim, Dominique Lapierre and Mark Tully to name a few. 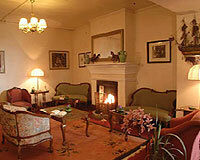 The Elgin Hotel is a luxurious cocoon for an exciting stay in Darjeeling. The Elgin Hotel has 30 rooms that are beautifully decorated and equipped with modern amenities. The Elgin Hotel has two restaurants called Kanchan and Orchid serving the best of Indian, Chinese and Continental cuisines.